Award-winning entrepreneur Ginz Ooi shares with us the story of his struggles as a novice entrepreneur, how he managed to get into a debt of RM1 million and repay it, and how he managed to eventually grow his company to make RM5 million in revenue a year. In 2009, at the age of 21, Ginz Ooi first went into business having just dropped out of college. Coming from Alor Setar to study computer science in Tunku Abdul Rahman College, he found himself disinterested in the academic portion of college life, often preferring to only play video games and not much of anything else. “I know it’s pretty bad to write about, but I’m fine talking about it,” he joked. Not all of his time at college was wasted, however. Through his own initiative, Ginz eventually also learned a great deal about software programming by trawling Google. This eventually got him noticed by his friends and led him to his first money-making venture. Along with six others, he set up an internet forum—the kind that was popular during the days of MSN and ICQ—and ended up selling it for RM50,000 a while later. The total cost required of the group to operate the forum was only RM300, and in the end each of them took home a share of just over RM7,000. This gave him a sampler of the entrepreneurship life, and within a year, his desire to do more led him to start his second venture—GBIZONE—an e-commerce platform that combined the models of Amazon, eBay, and Alibaba while allowing young entrepreneurs to start their own businesses on their platform. All was going well (RM1 million revenue in six months despite being self-funded) until his most important business partner absconded with the company funds, leaving Ginz with a debt of around RM1 million and no business partners to help him through it. The suppliers and creditors came knocking, and he had no funds to pay them back. During this time, his seemingly insurmountable mountain of debt caused him many problems—his romantic partner left him, he went through an emotional crisis, and he was forced to steer a sinking ship despite not having any expertise in sales, management, finance, or marketing. Needless to say, it was an extremely difficult period for the Kedah-born entrepreneur. But one that acted as a watershed moment in his life. Fast forward to 2019, Ginz has turned around his fortunes, levelling the mountain of debt and reshaping the once-struggling GBIZONE into Webqlo—now a digital marketing and advertising agency that provides a one-stop platform for users to develop websites, apps, do content marketing and digital advertising. And along the way, he’s earned plenty of recognition as an entrepreneur and businessperson, winning The Golden Bull Award, SEBA, and earning a spot among the list of Top Outstanding Young Malaysians in 2018. As you can expect, all of this was through nothing else but extremely hard labour and plenty of sacrifices made. During the crisis period, he relentlessly pursued side hustles in the day, surviving on nothing but white bread (topped with mayonnaise as a special treat) and maggi goreng for months on end, and stockpiling funds just to eventually clear his dues. He even called all his phone contacts at one point, and asked them to buy him lunch or dinner. And when things finally looked up in 2014, Ginz explained that he kept pushing instead of taking it easy. His company then took on more and more projects, expanding their scope of expertise and steadily adding to their team to accommodate bigger projects. 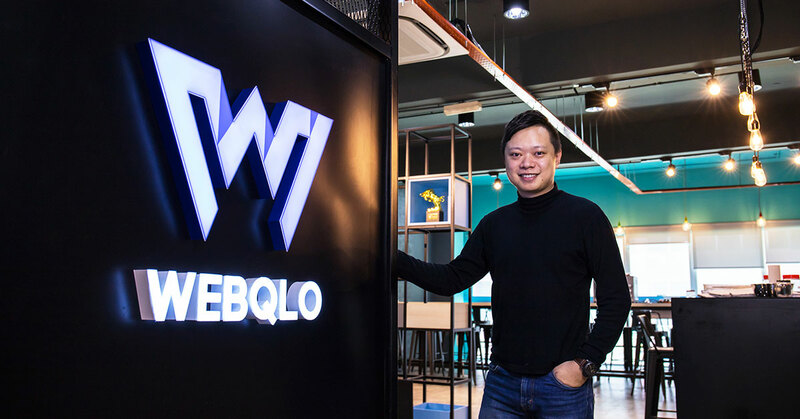 Today, Webqlo is a world away from the mess that it was once in. It runs as a 30-strong team, and margins are in the pink of health. Ginz told us that they have an estimated RM5 million a year in revenue recorded back in 2018, and they’ve also now moved into the big data industry with their social media marketing analytics platform Adqlo vying hard to become the forerunner within the smaller SME segment. His success in steering the ship around could have something to do with the strong business drive he developed as a youth. From selling wild spiders he caught in the forest to selling virtual game items online, Ginz had always looked for a way to make an extra buck for himself, boosted the fact that he had also never received pocket money from his parents as a kid. Knowingly or unknowingly, it all came into play during the most crucial of moments, and Ginz now couldn’t be more proud of what he’s managed to make of things. “This is what I really wanted to create—I’m not a money-chasing type of person, so I didn’t really work for money,” he said. So what does Ginz hope other entrepreneurs will learn from his story? “I think the most important part is that you have to always stay positive and believe that you will create something for yourself,” he added. He especially singled out the youthful crowd of today—the Gen Z bunch—as having the attitude of giving up easily when the going gets tough. However, despite what he has experienced, Ginz thinks that he is lucky to have gone through the struggles beforehand. You can find out more about Ginz’s business Webqlo here.